All the dice rolls and stat-managing of real DnD, but now with half the fun! To many, the idea of a full fledged DnD campaign on the go is an appealing one. It certainly was to me, being a long time vet of the game and short time professional Dungeon Master. But my own attraction to the game was never to the ruleset itself, but in the opprotunities for communal creative play. 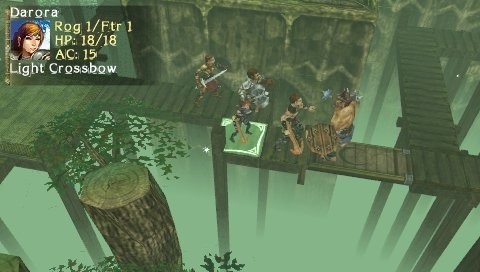 At its best, the game encouraged friends to think creatively and explore aspects of their imagined roles in enviroments and stories that they wove together. At its worst, you'd have hours of banal dice rolling and rule scrounging with players arguing over who has the better stat boosts. And that is the critical miscalculation with the videogame right from the start. All the energy was spent making certain the rules were in place, when someone should have been asking "Does this really make a great videogame?" No. The game is simply too bogged down in entire books worth of rules and stats to make it, as a videogame, accessible and entertaining. It can take an hour or more to generate a party to your liking. The argument for this, is that there is a huge breadth of options to take advantage of. The argument against, is that for all your efforts the game never gets any easier. It could easily be over half an hour to organise the items of each individual party member before any single mission. When you have to watch the weight of each and every item you pick up for each of your six party members, in order to avoid incrimental degrees of incumberance, you're in for a very long and tedious game. The tedium doesn't end in just the preperations. It can take a few minutes just to walk your party members to the other side of a room. You'll curse yourself the long trek back once you realised you've made the wrong turn. It can take upwards of ten minutes to defeat a single ordinary creature, with no one hitting anyone. Just invisible dice rolls and the word "miss" popping up over each others heads. It gets worse, especially if you forget some of the more mundane rules including the horrendously unforgiving nature of spell failure. But some would argue that's just how it should be for all the depth that is offered. Well working against that is a very simple exploit. In most cases, especially in the dungeon crawls, its easy enough just to use the rest option after any encounter and regain all health and spells. All too easy, all too lengthy. For all my complaints, I bet there are a few out there who are still thinking, "Well yeah, but that's how you play DnD. I'd buy that with what you're describing." All right, I can't blame you. There is some enjoyment to be found in the mountains of stats, coupled with the pride you find in developing your ultimate munchkin. (Yes I said munchkin, look it up.) Then let me warn you of its other faults. The music is kind of like a terrible cover for Enya, looping every thirty seconds. The graphics aside from the neat realtime lighting effect from torches and light spells, are barely worthy of the PS1. The character models are hideous, so are your options for designing your heroes. The basic animations are dull, overly long, but thankfully skippable with an option found in the menus. And for some reason beyond me, the controls are attrocious. This isn't an action adventure run and gun jump around type of game. This is pretty much a game of chess! And when you get frustrated because your trying to select the grid that you want, something is wrong with your game. You have to penetrate a maze of convoluted menus just to begin to discern what your current attack bonuses are against a specific enemy. There is no story worth mentioning. Its saving grace could have been its ad-hoc multiplayer. But that comes with the familiar situation for many PSP games, that it's going to be damn near improbable that you can get some of your PSP toting friends to buy this game. Even then, it's limited to preset characters and the most basic of dungeons to hunt together or deathmatches to decide who has the better dice rolls. No multiplayer co-op campaign, because that could have been rather good. At such a point, I'd just have to recommend you buy yourselves some dice, a notebook, and a players manual. 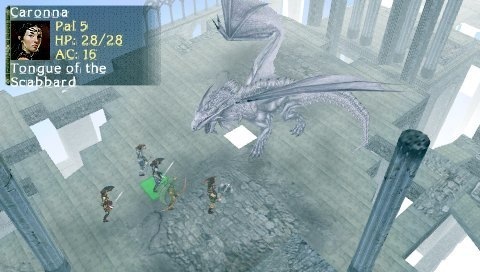 Here it is, the pen and paper classic Dungeons and Dragons represented in videogame form on your PSP. The deep ruleset makes the transistion largely intact, and the campaign itself is impressive in its length. It is what it is. That might have been the best that could have been said of it. If only the results just worked with some kind of grace and style. What we have left is Dungeons and Dragons, sans the imagination, sans the bonding, sans most any reason why it shouldn't have been left in your parents basement.